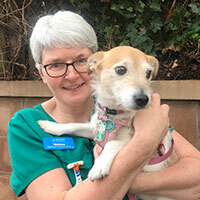 Melissa Fairweather joined the team in February 2018, she qualified as a veterinary nurse in 1995. Her main interests are in-patient care and rabbits and small furries. She has recently started running rabbit health clinics from the St Andrews and Ladybank surgeries. Outside of work her main interests are walking with her Jack Russell Shelby, wildlife and the outdoors. She is also a massive 80's music fan.